The D37HRS compressor is an oil-free solution from CompAir and has been certified ISO 8573-1 Class Zero (2010) and silicone free, making it better and safer with no risk of oil contamination. The unique design of the DH range achieves both lower speeds and lower operating temperatures, which results in high efficiency and reduced component wear. The D37HRS compressor has fewer moving parts than similar machines, meaning there is less to go wrong. The compressor uses a single-stage, direct-driven motor without fears or belts to maximise efficiency and minimise required maintenance. The water injected design lubricates, cools and seals the compression process, maximising efficiency. With running temperatures of less than 60°C, near isothermal compression is achieved. Delcos XL control system ensures safe and reliable operation of your compressed air system by continuously monitoring operational parameters: pressure, motor speed, running hours, volume flow. It has a user-friendly touchscreen interface with integrated SD card for in-depth analysis. 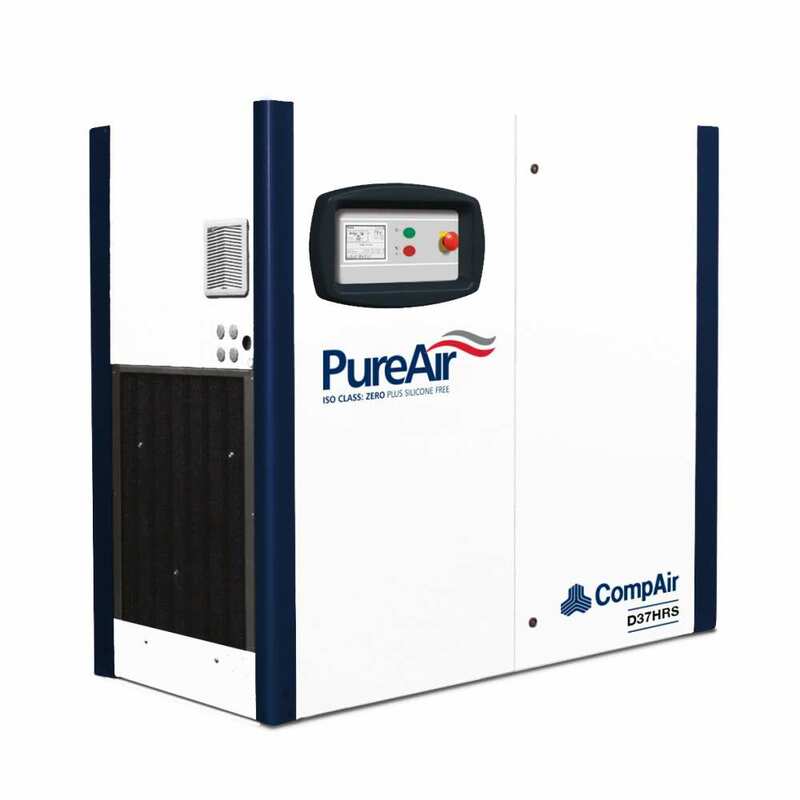 The CompAir D37HRS air compressor is able to precisely match power consumption with the system air demand, offering outstanding efficiency and reliability. The right variable speed compressor in the right application delivers significant energy savings and a stable air supply at constant pressure – using a regualted speed compressor can save up 35% energy! The CompAir Assure Warranty covers your D37HRS air compressor up to 44,000 hours or 6 years (whichever is the soonest) giving you complete peace of mind when making your purchase (subject to Terms & Conditions).